Really guys? Yes, werewolves in books and movies are usually predatory monsters that rip humans to shreds. But telling someone that being a werewolf means that you’re like a wolf and that wolf instincts make them attack humans is just ridiculous. Why? Because real wolves don’t go out of their way to attack humans. Yes, wolf attacks happen, but as a whole wolves stay away from humans. Do you see where I am going with this? You can’t tell someone that they will have wolf instincts and then in then in your next sentence say that they will destroy their loved ones. It doesn’t make any sense. Now, I’m not saying that becoming a werewolf won’t make you a monster. It’s possible that werewolves are horrible creatures of death and destruction, just like in the movies. But that has nothing to do with actual wolves and wolf behavior. Wolves are predators, they hunt and they kill, but they don’t wake up and think “hmmm I big bad wolf, I think I’m gonna eat me some humans today.” If confronted by humans they retreat. Wolves tend to stay in their own territory, the only real reasons a wolf would be near humans is if they’re sick (rabies make animals behave strangely) or if there is a lack of wild game and they’re looking for food (pets and livestock). 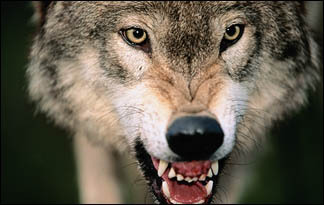 Yes, if provoked a wolf will attack if they feel the need to, but since wolves usually stay away from people this is rare. I’m not saying wolves are friendly and cuddly lil’ critters, they are dangerous and they can kill you. But “their instincts” don’t make them go out of their way to hunt down humans. Some of you may want to do some research before telling others that “being a werewolf is like being a wolf, you’ll kill humans in wolf form.” That’s not true. Being a werewolf may make you a monster, but that has nothing to do with real wolves and real wolf behavior.